Posh midfielder Gwion Edwards beat former goalkeeping team-mate Luke McGee with this shot, but the ball struck the crossbar. Photo: Joe Dent/theposh.com. Popular Peterborough United central defender Steven Taylor was voted man-of-the-match against Portmouth by the match sponsors. 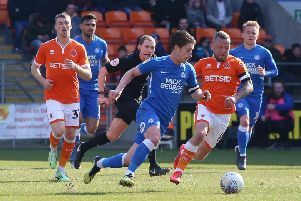 He was a worthy contender, but the Peterborough Telegraph reckons two more assists for Marcus Maddison made him the main man again in a vital 2-1 League One win. Posh striker Jack Marriott makes a sliding tackle against Portsmouth. Danny Lloyd in action for Posh against Portmouth. Photo: David Lowndes. Andrew Hughes: (for Tafazolli, 46 mins). Jermaine Anderson: (for Maddison, 83 mins).